Well, for those that don’t know, I’m off to Vegas tomorrow. My wife and I are renewing our vows for our 10th anniversary and there’s no better way to do it than to do it in Vegas by Elvis. So that’s happening for me this weekend. I wanted to jump in today with a quick comic review. The first of DC’s “New 52” came out and I got my hands on it. It was Justice League #1. 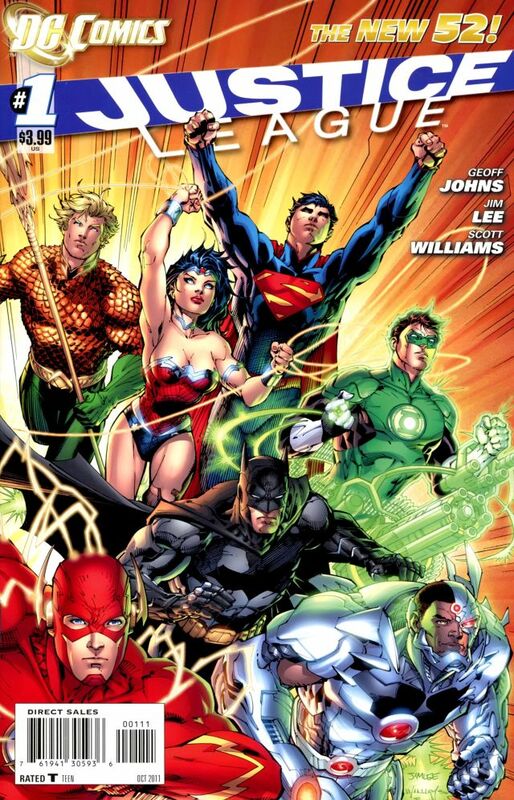 Written by Geoff Johns and drawn by the awesome Jim Lee, this comic begins DC’s journey into Rebootville. I wasn’t for sure what to expect going into this. I was a little excited, a little apprehensive. I just wanted a good start to this whole thing. Plus, I didn’t know where they would begin. Will we see the origin of the JLA, or will everything begin further back and we’ll eventually get the full-fledged JLA. Let’s see. I loved milk commercials when I was growing up. There were tons of them and they were shown all the time. And there were so many versions of the ads that it was endlessly interesting. So on this Friday, I’m going to show you a bunch of my favorites. Let’s start with one of the most iconic. The one directed by Michael Bay. The “Aaron Burr” commercial. Next up are the “Milk it Does a Body Good” commercials. These are the ones I generally think of when I think of milk commercials. There were two versions of these. The first was a series of musical numbers featuring kids and random images of things flying all over the place. Things like animals (cows, penguins and kangaroos). Check out the awesome 80s randomness of this ad featuring a lot of kangaroos. Seriously, kangaroos on pogo sticks and tap dancing kangaroos. Here’s the “cow on the moon” musical PSA. …and here’s the penguin version. The other version of the “Milk it Does a Body Good” PSA involved kids talking to someone about the benefits of drinking milk. As they talk, they transform into an older, taller, better looking version of themselves. There were even two versions of this ad, one in which the kids were talking to someone else and one where the kids were looking in the mirror talking to their future selves. All of these commercials are filmed in front of a gray backdrop that looks like a crinkled up curtain. I love the various advertising campaigns for milk. From as far back as the 80s, they’ve had some of the more consistently entertaining commercial and print ads ever. There’s just something about them I enjoy. Everyone remembers Michael Bay’s “Aaron Burr”. Or the fun “Milk it Does a Body Good” commercials. Or the ubiquitous “Got Milk?” print ads. Classic advertising. I especially like the ones I’m going to show you today. 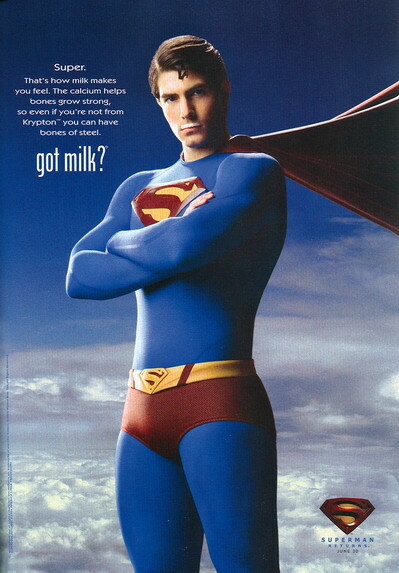 They are all print ads for the “Got Milk?” or “Body by Milk” campaigns and they all feature movie versions of comic book super heroes. I love explosions of pop geeky culture like this. I found many of these while thumbing through old magazines I had in my garage. 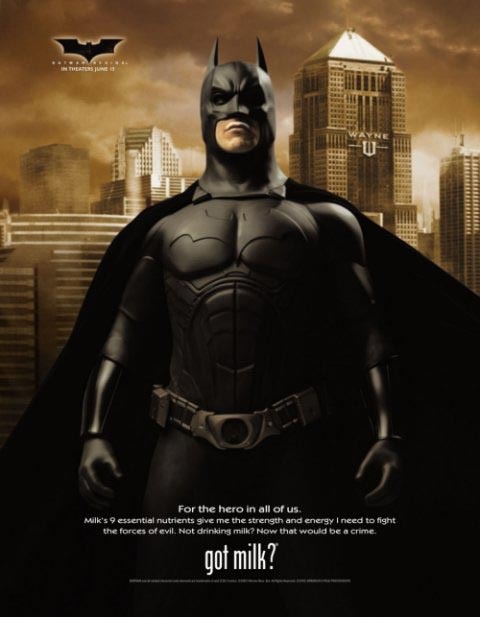 Batman Begins (2005) and The Dark Knight (2008) – Two of the greatest Batman movies we probably will ever see. The Dark Knight is great, however, for re-watchability, I pick Batman Begins every time. 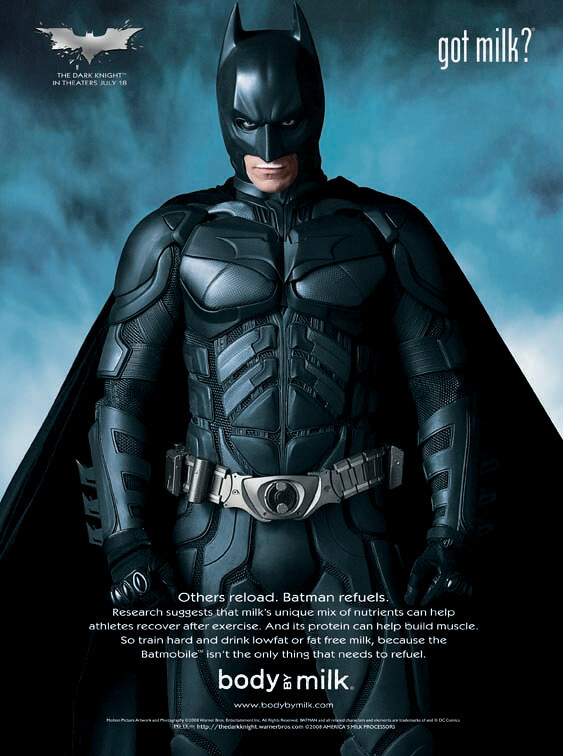 I love the sequel, I really do, but when I want to watch a Batman movie I put on Batman Begins. Superman Returns (2006) – I love Brandon Routh. However, this movie sucked. One giant missed opportunity. The lead was great and the effects were awesome. But everything else was wrong. 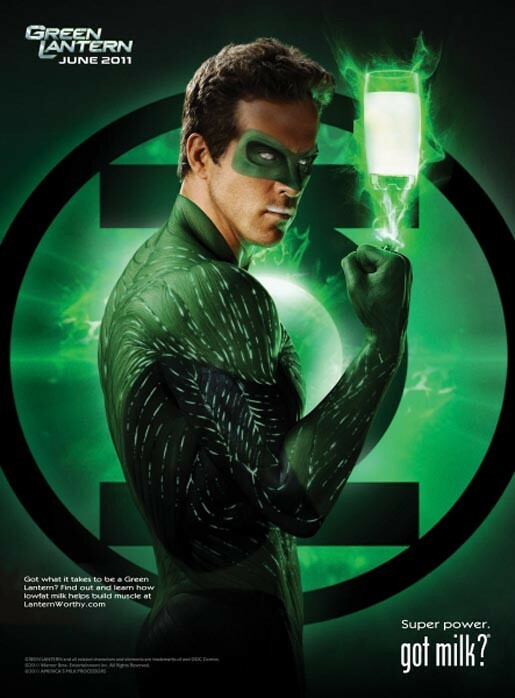 Green Lantern (2010) – This movie ended up exactly like Superman Returns. The lead was great and the effects were awesome, but everything else was a fumbled missed opportunity. Kudos for a great looking ad, though. 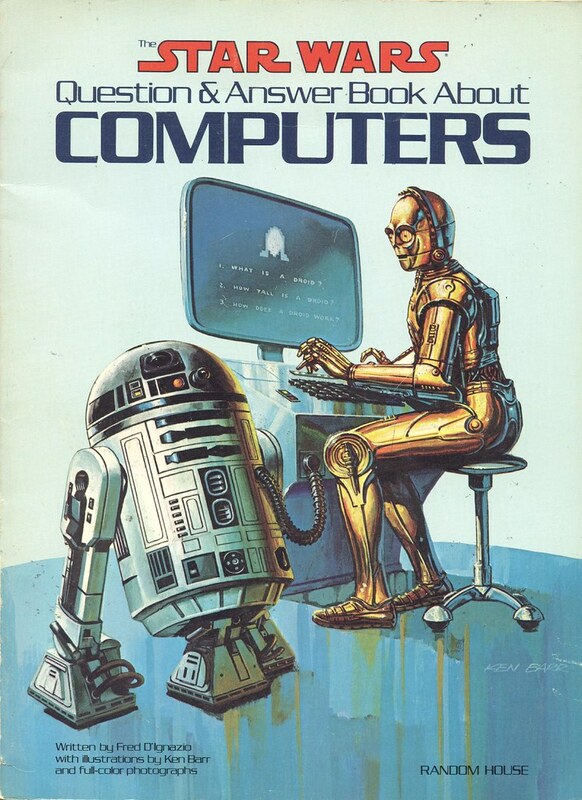 Earlier this week I looked at the awesome Star Wars Q&A Book About Computers from 1983. In there we got to see Artoo and Threepio show us the until then current history of computers including an awesome painting of the droids playing an upright video game. 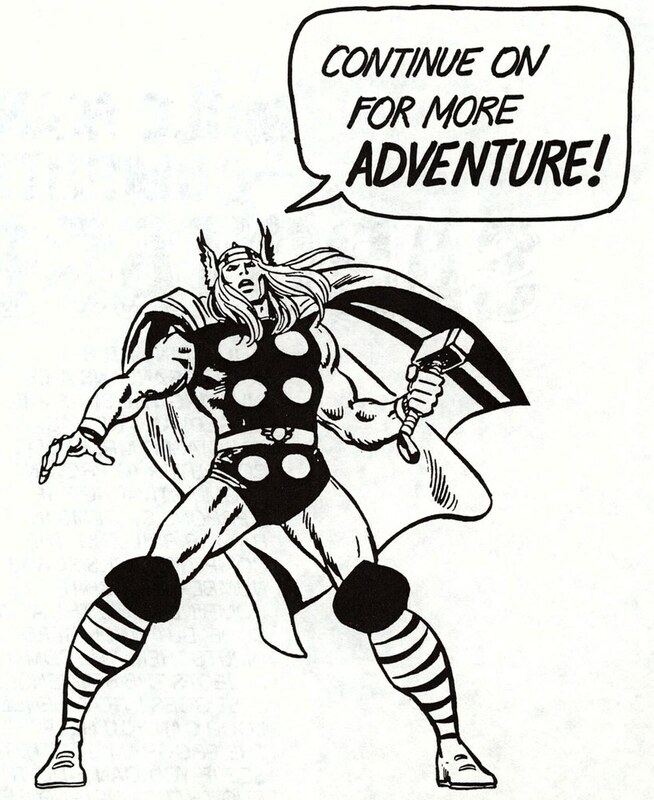 Then I took at look at the Marvel Super Heroes Computer Fun Book Two from 1984. 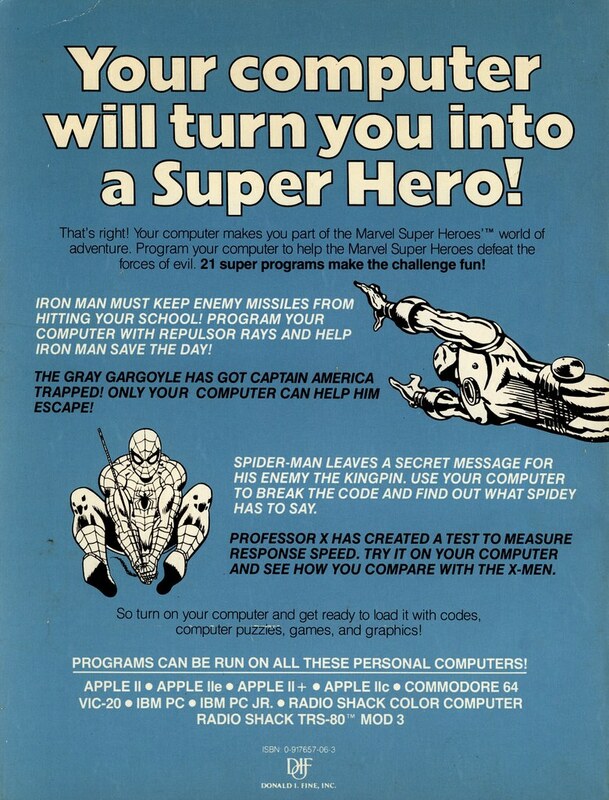 In there we saw lots of BASIC code for programs based on Marvel Super Hero adventures like the Iron Man Robot Retriever and Doctor Strange and the Computer Gremlin. 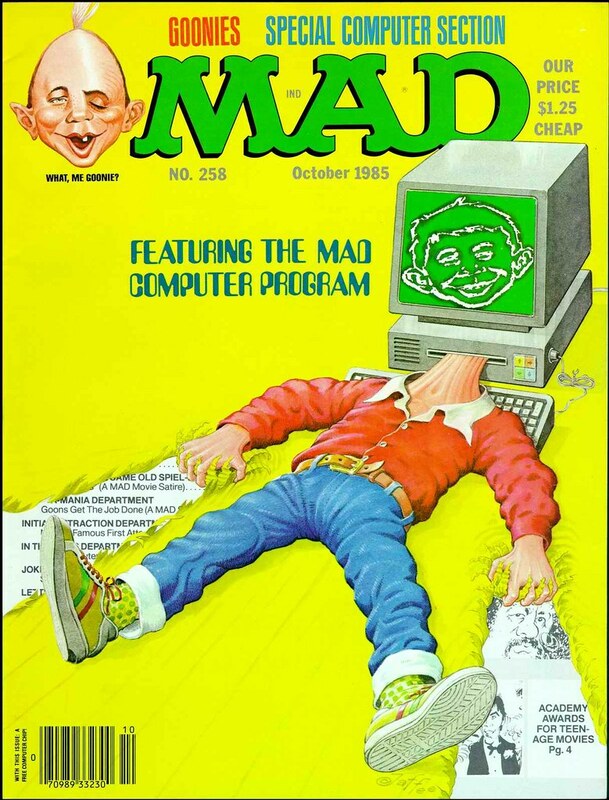 Today, I’m continuing my look at vintage computer activity books with Mad Magazine #258 from October 1985. 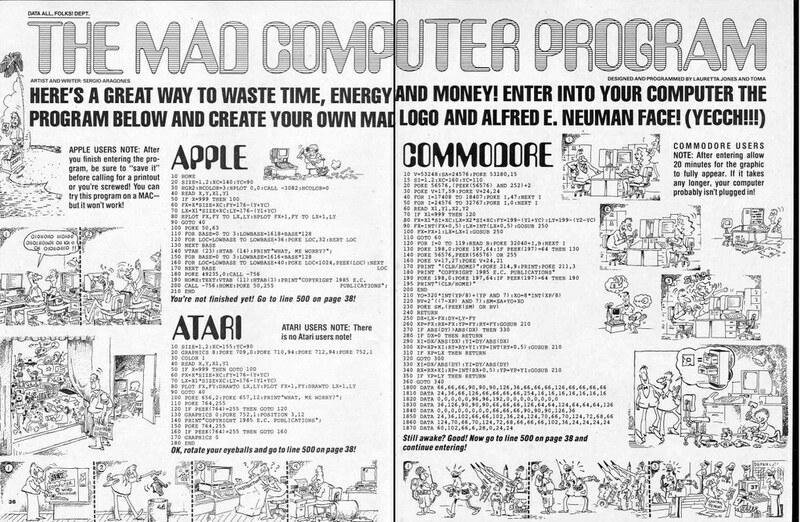 This particular issue of Mad had a special “computer section” in the middle of the magazine. 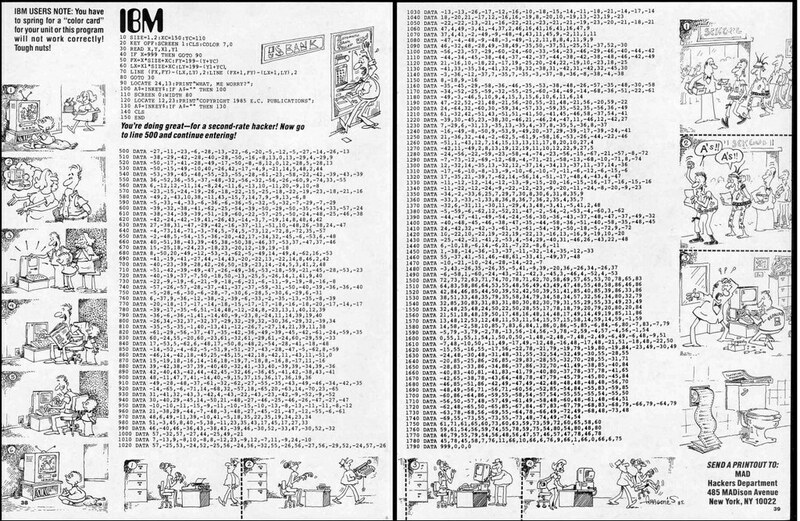 The feature article in that section was the Mad Computer Program. 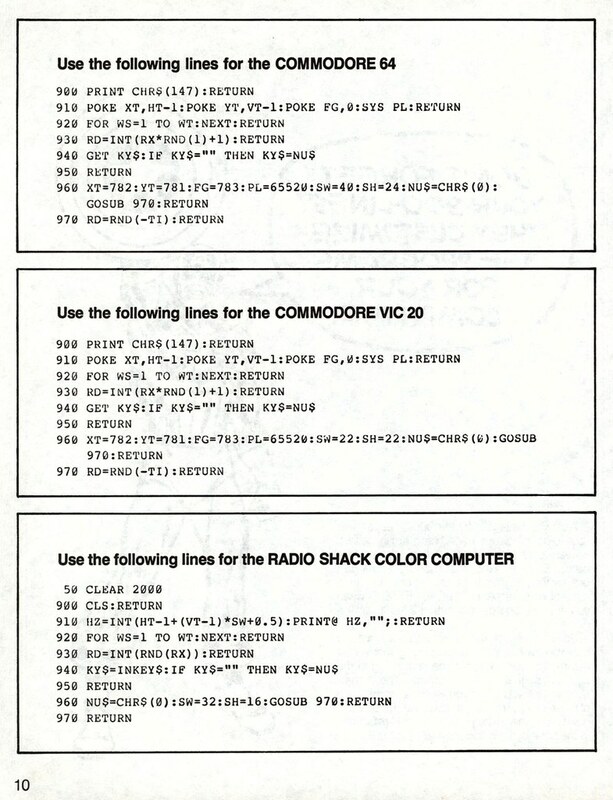 The article provided code for three major BASIC platforms that you could enter into your computer and when you run the program, it would print out a special surprise output. You can click the images above to see the code more clearly. Yesterday I looked at the Star Wars Q&A Book about Computers. 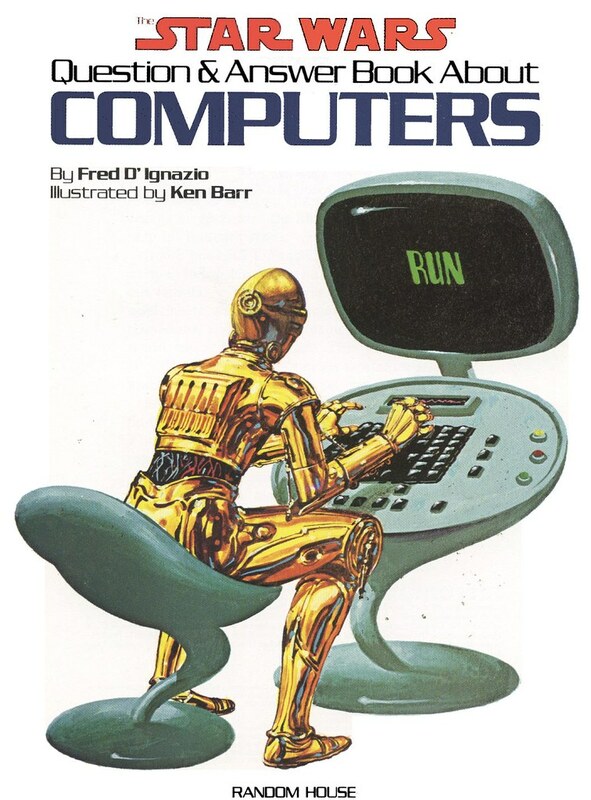 It featured a history of the computer (through 1983) and some awesome art by Ken Barr. 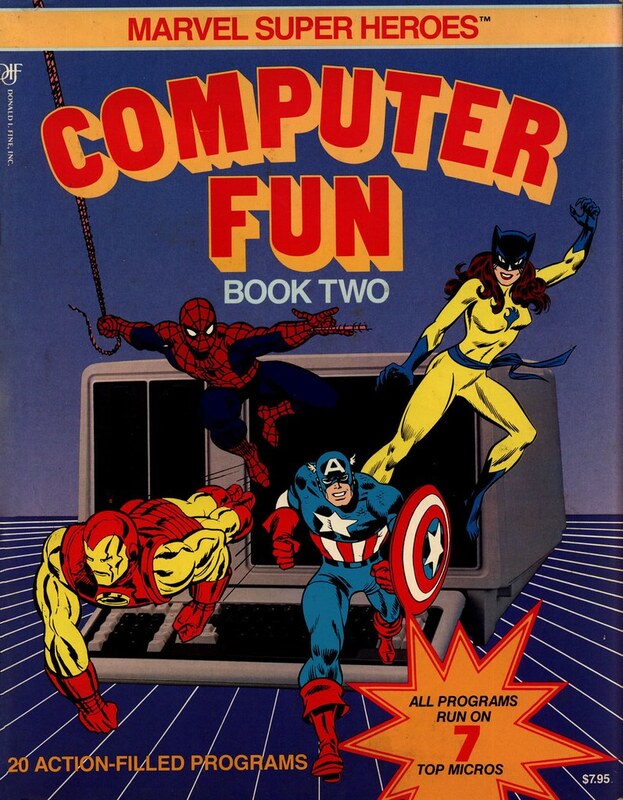 Today, I’m looking at another awesomely vintage computer book, it’s the Marvel Super Heroes Computer Fun Book Two from 1984. This book is LOOOOOOOOONG and it features A LOT of programs. I’ll just be looking at some of the more notable programs and artwork. You can check out my Flickr set to see more. Here’s the cover to the activity book and the intro page telling you what to expect inside. 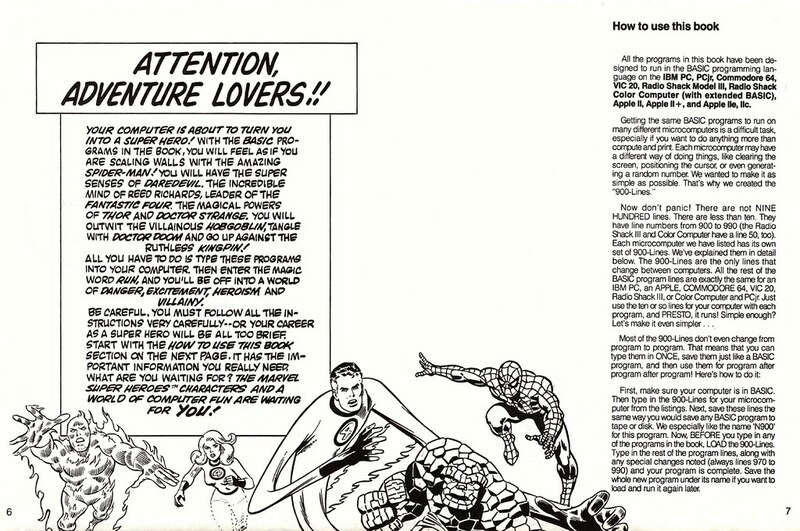 And here’s the Fantastic Four to tell you how to use this book (in case you weren’t already aware that you used it to, you know, program your computer). 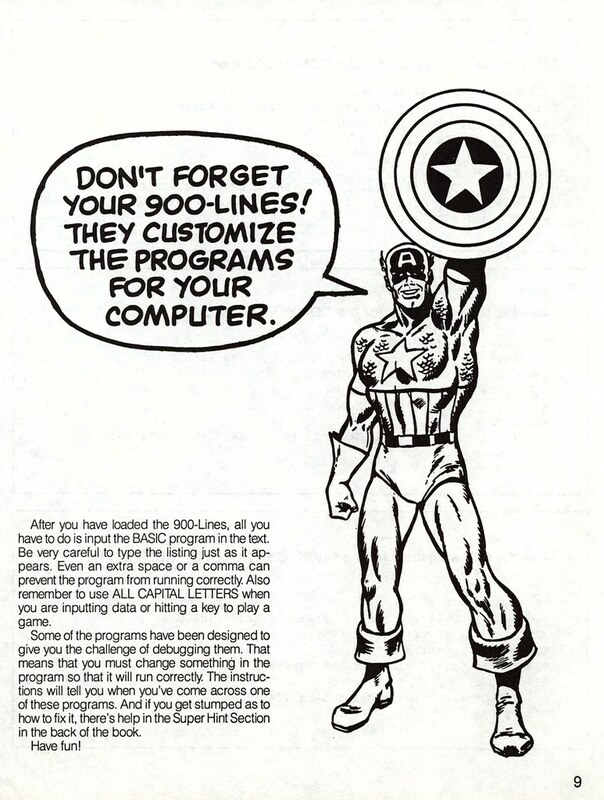 Here’s Capt America reminding you to code your 900 lines. 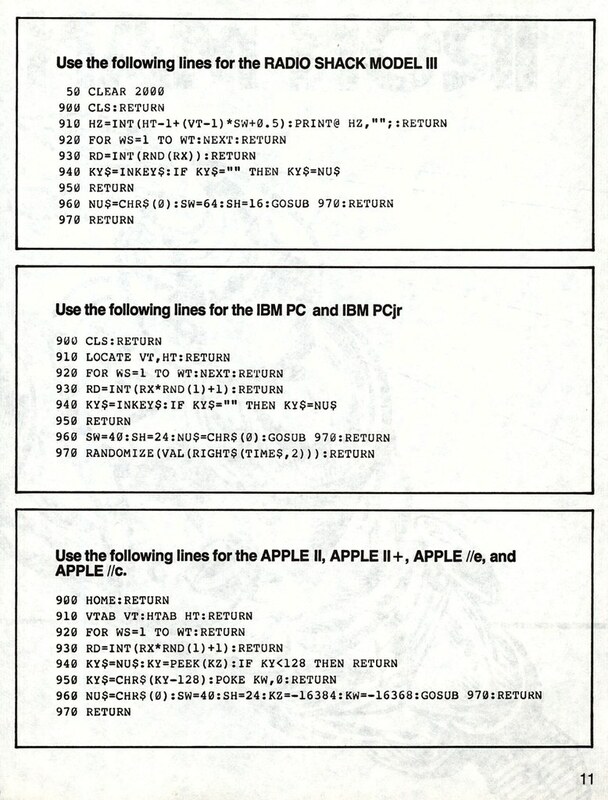 He gives you 9 examples (there’s another page of code I’m not showing you) of 900 lines from different BASIC environments like the Commodore 64, IBM PC and Apple II. 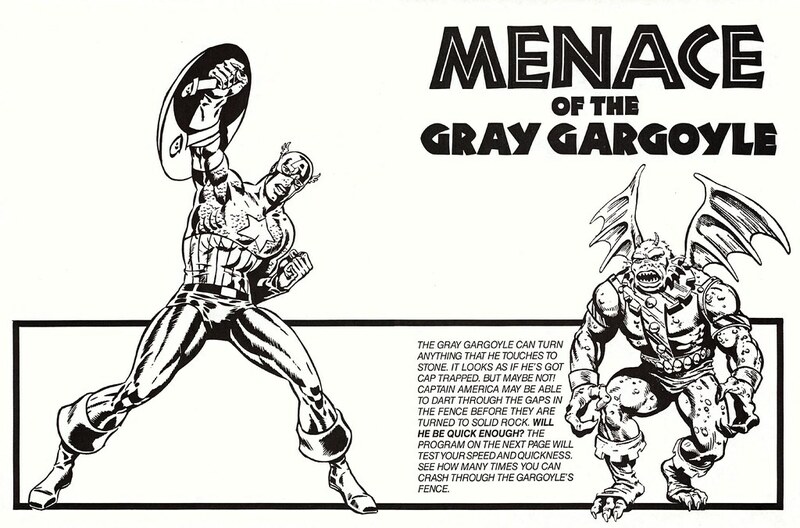 Here’s a program featuring Cap called Menace of the Gray Gargoyle. It’s a “fence busting” program. 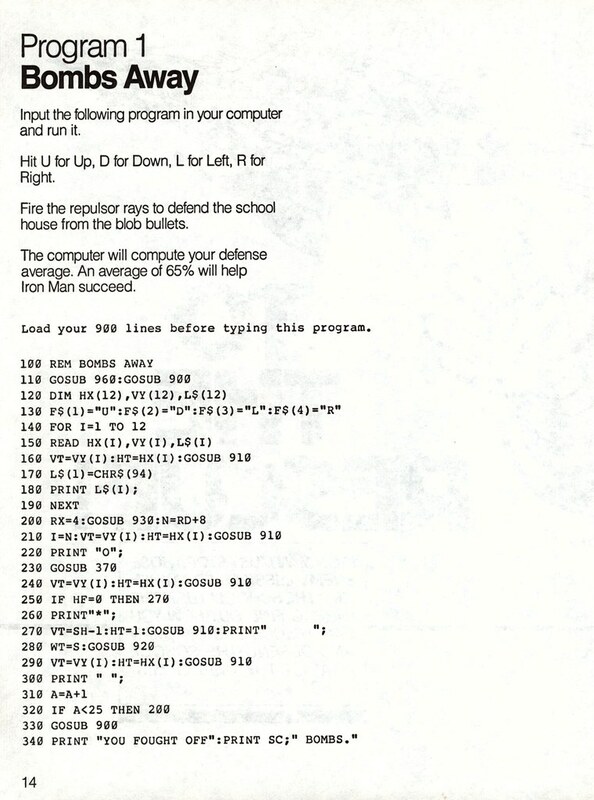 See the code here. Man, that Gray Gargoyle looks lame. This program is called Iron Man to the Rescue. It’s a game in which Iron Man has to stop a ship from shooting missiles at a school filled with children. Hope you get them all or the deaths of thousands of small schoolchildren on your head. Is it just me or does that seem like a needlessly violent scenario for a kid’s computing activity book? 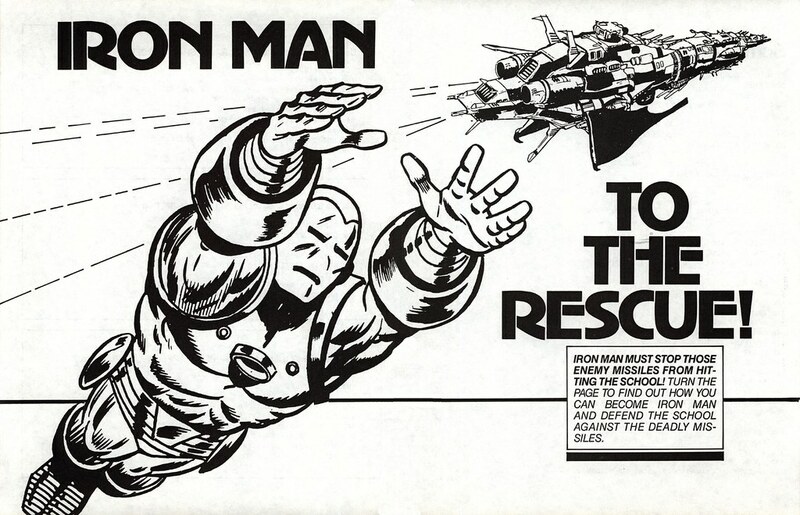 There are two other Iron Man programs. The first is called Robot Retriever. 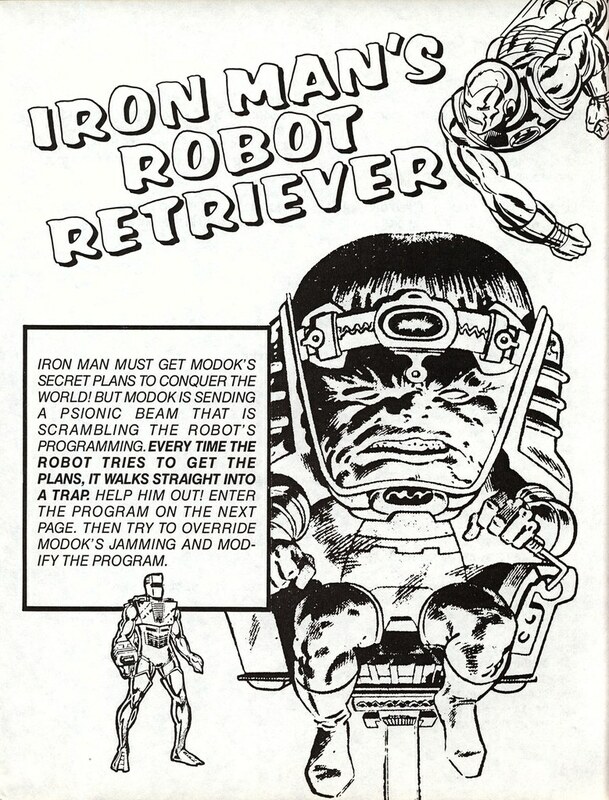 It’s awesome because the title page features MODOK and ROM: Spaceknight. 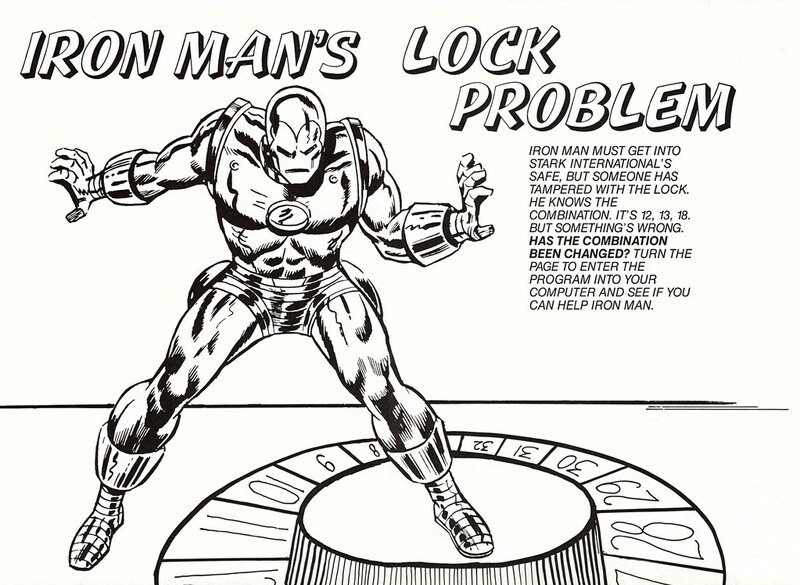 The other is Iron Man’s Lock Problem. I like the artwork on the title page. I didn’t realize Iron Man was popular enough in the 1980s to get three programs in this book. One of our friends here in Jacksonville is a member of the 501st Star Wars costuming group. They were having a fund raiser at a Chik-fil-A here in town this past weekend so Steph and I took PJ down to see all the costumes. 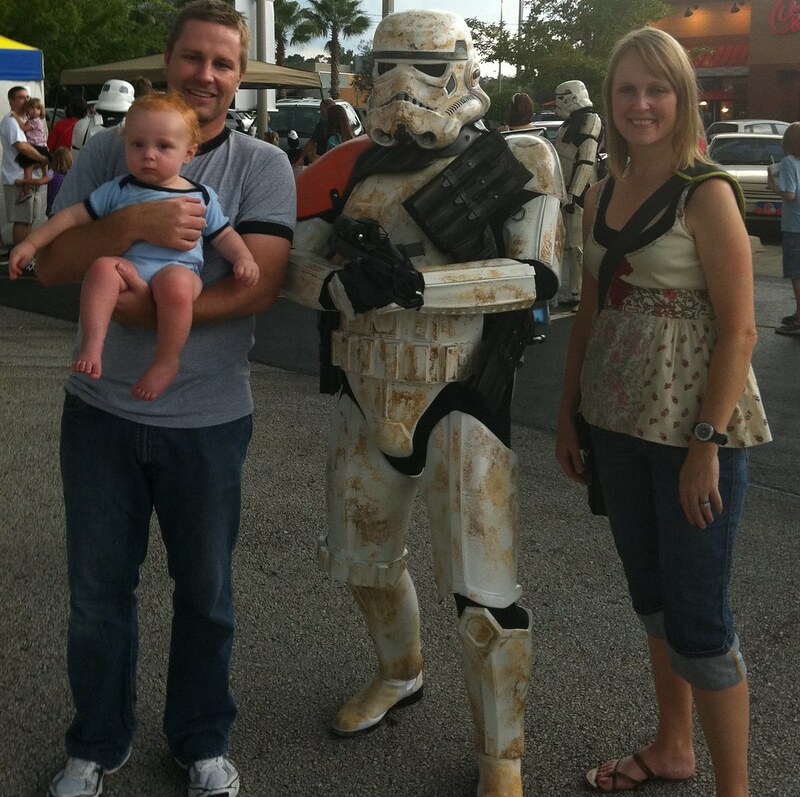 Here is PJ just after meeting his first Stormtrooper (or, technically, a Sandtrooper). PJ was not too sure about the man in the scary costume at first. You can see he’s a little concerned in this picture. However, after about 10 minutes he became somewhat fascinated by all the costumes. Even going so far as to grab the Stormtrooper’s gloved finger and shake it. It was a lot of fun. 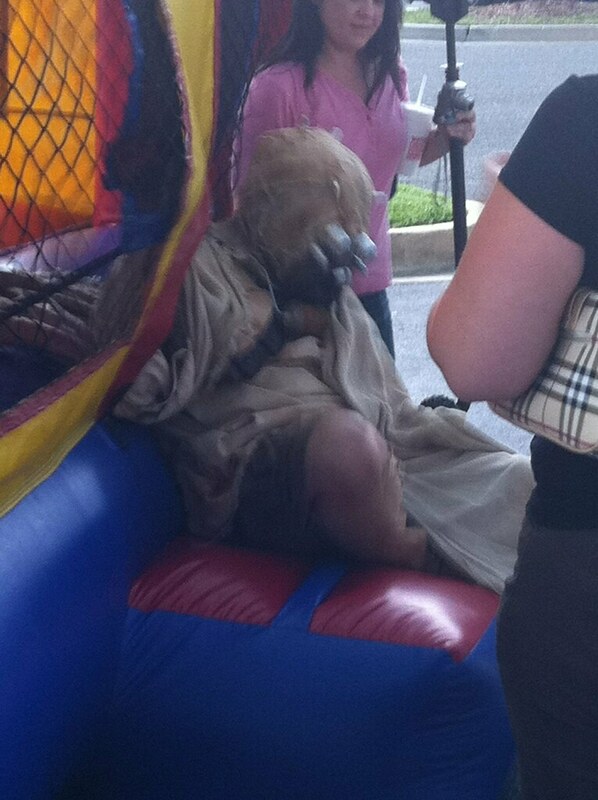 What made it even more fun was the fact that I got to see a Tusken Raider think it was a good idea to climb into a Jump Castle with like 15 kids. He came to regret that decision. I love vintage kids books. I love vintage pop culture books. I also love vintage books looking at early computing technology. This week, I get all three wrapped into one. I’ll be looking at three early 80s activity books featuring awesomely retro computing technology. Being a tech guy and a pop culture guy sure pays off some days. 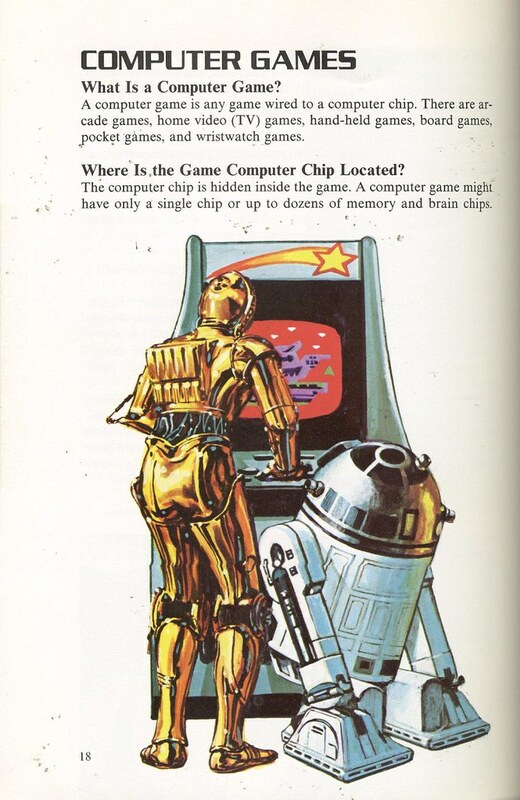 The first book I’ll be looking at is the Star Wars Question and Answer Book about Computers from 1983. Yes, I know, mixing Star Wars and computer technology? Yes, please. 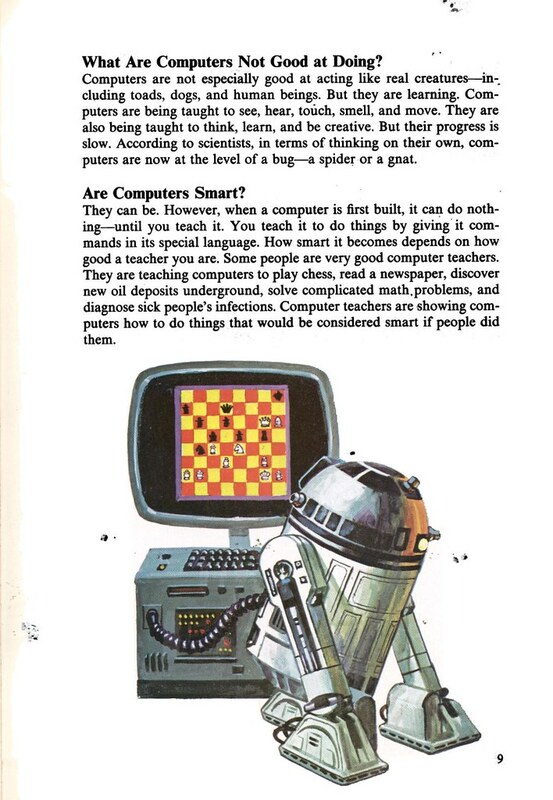 And the book is filled with some of the most awesome artwork mixing R2-D2 and C3PO and computer machinery. The artwork in this book is by Ken Barr. Ken Barr is a comic artist. He’s done a lot of work for Marvel, especially back in the 70s and 80s with titles like Deadly Hands of Kung Fu, Doc Savage, Savage Sword of Conan and Rampaging Hulk. Most of that work being for Marvel magazines that showcase the really nice painted look of Barr’s creations. You can see a lot of that here, too. 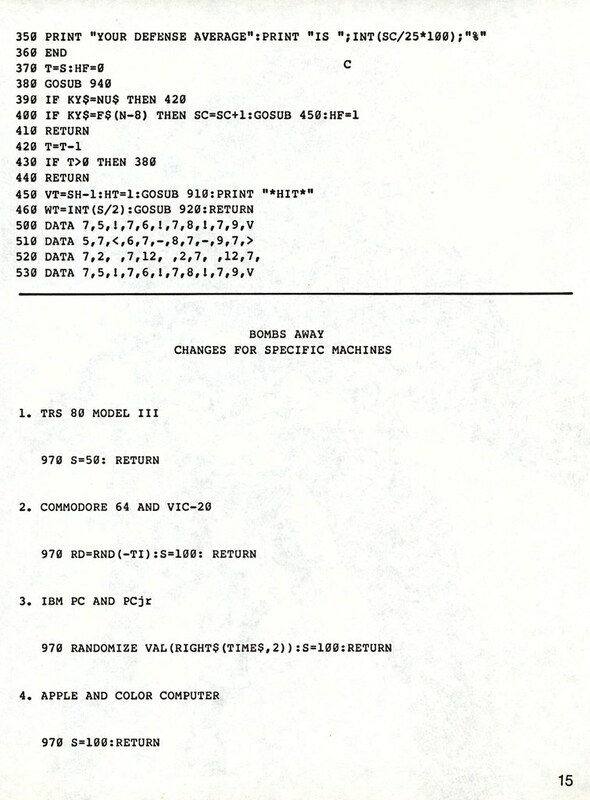 This book is mainly an information dump about computers, how they began and what they can be used for. Much of the information is surrounded by Barr’s gorgeous paintings. However there are also pages without artwork but instead use photographs of actual computer machinery. 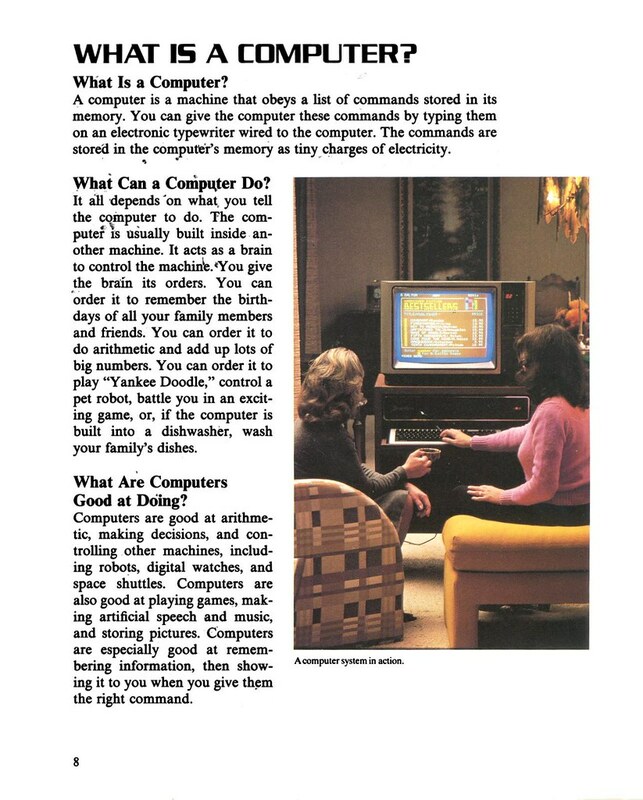 Here’s the intro to the book explaining about computers. 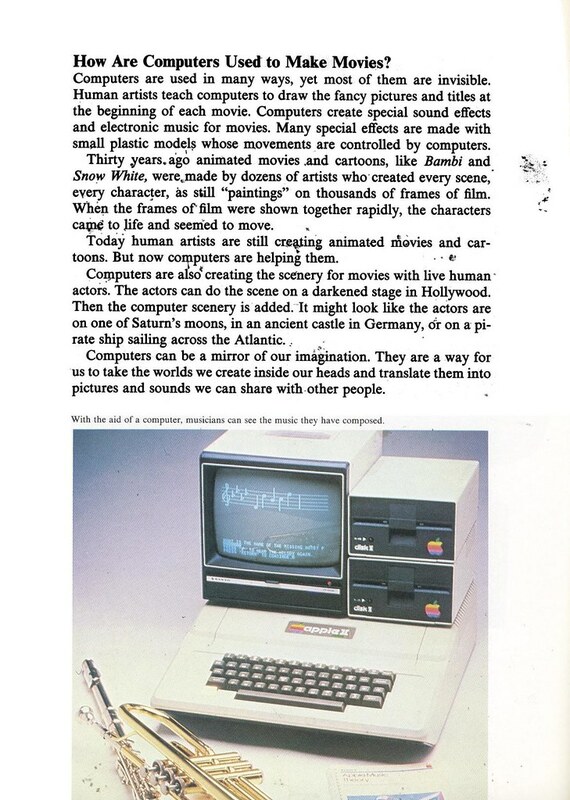 Next to the intro is another information page featuring a picture of an Apple II. Click the images to make them BIGGER.